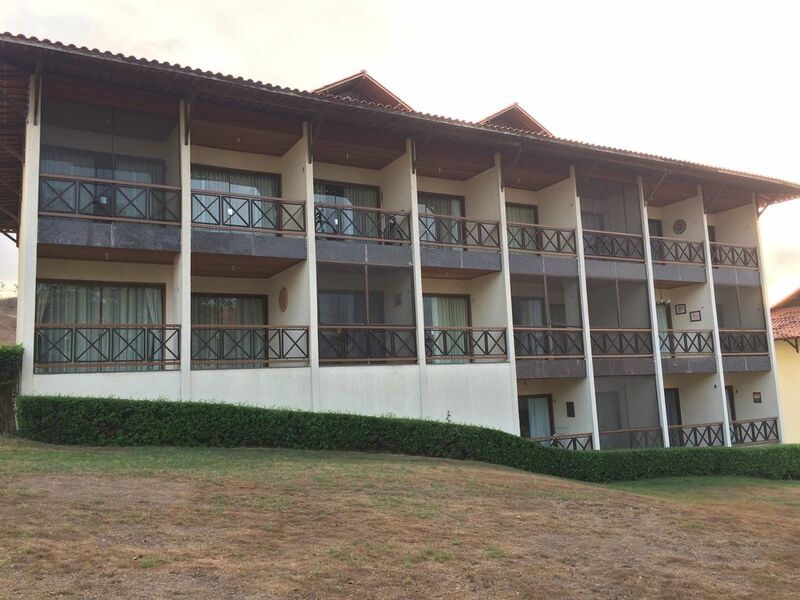 The flat is within the complex Hotel Fazenda Monte Castelo Flats located in Sairé 8km Gravesend. It has a complete recreation area with water park with heated pool, tennis and volleyball courts, soccer field, game room, playground, small farm, restaurant, wine bar, lake for fishing and hiking. Activities for the children on weekends and holidays. The flat is all ground INSECTS WITH ISOLATED AGAINST SCREEN consists of bedroom, living room, bathroom, kitchen and balcony. Sleeps 5 comfortably two in a double bed, two in sofa bed and a mattress on. Bedroom with a double bed, split air conditioning, mirror, wardrobe, LED TV 42 "and bathroom with closet. Living room with double sofa bed, single futon, rack with LED TV 42 "fan, and dining table. full kitchen with counter / sink, cabinets, stove, refrigerator, microwave, blender, sandwich maker and kitchen utensils. Balcony with a hammock and chairs. Fiquei apenas 1 dia, mas já indiquei a todos meus amigos! O contato com os animais das crianças na fazendinha, piscina, restaurante, sensacionais. Recomendo! Hotel Fazenda Monte Castelo is located in Sairé 8km Gravesend. Entertainment area complete with water park with heated pool, tennis and volleyball courts, soccer field, game room, playground, small farm, restaurant, wine bar, lake for fishing and hiking. Recreational activities for children .Cavalgadas and carriage rides are available at extra cost.